The StockMarketEye log file contains technical information about what StockMarketEye is doing while it runs. This file is often helpful in determining the cause of problems you might be having with StockMarketEye. You can access the StockMarketEye log file via the “About StockMarketEye” window, in the “System” tab. The StockMarketEye support team will often ask you to send the log file to them in order to help diagnose any problems you might be having. If you know what action causes the problem, before sending the log file, please repeat that action in the StockMarketEye window. To send the log file to the StockMarketEye support team, the preferred way is to attach the “sme.log” file to an email. You can also copy-paste the contents of the file into an email. The log file can also be accessed directly on your hard drive. 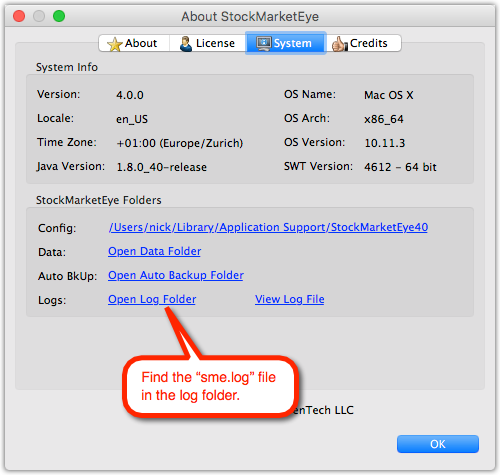 Depending on your computer, here’s where you can find the StockMarketEye log file. Note: On Lion and later, the Library folder is hidden by default. See this page for how to unhide it.